The province of Guipuzcoa, in the Spanish Bask country has an extremely rich heritage. 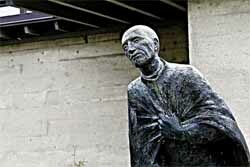 Historically, it is also a very important place: Ignatius of Loyola was also born in a village of Guipuzcoa. During a fight against the French in Pamplona, Ignatius of Loyola was wounded and forced to rest. He started to read, mainly novels and essays about the saints. This was the starting point of his spiritual conversion and marked a radical change in his life. Visit the “Casa Santa” and relive the adventure of Saint Ignatius. In Loyola, you will also have the opportunity to visit the basilica surrounded by buildings owned by the Jesuits and hosting a spiritual center, a large library and a radio studio. For more information about the Loyola shrine, visit the shrines' website or the tourist information center of the Spanish Bask Country.